In 2011, the Pollard lead Boston Spaceships released their final LP. Let It Beard was a sprawling 26 song, double LP exploring the Pollard gamut, displaying his often quoted, "the 4 P's" that make up the Pollard catalog; pop, punk, psych, and prog. Like Pollard's 2004 release Edison's Demos, this became the 2nd official release of demos containing original sketches to a particular LP (the aforementioned contained demos to GBV's Earthquake Glue). 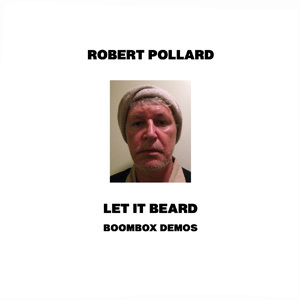 Unlike Edison's Demos, the Boombox Demos feature the entire Let It Beard album, in sequence. Also, unlike Edison's Demos decent production, these cuts are extremely rough acoustic guitar and mumbled vocals numbers. FOR FANS ONLY. But, I guess if you're listening to something called Boombox Demos, you're probably a fan. Released 10 weeks after the initial release of Let It Beard, this web exclusive CD sold out in a day. It later became available for free download, via the gbvdigital.com site. The collection of songs provides some minor, if not completely unnecessary, insight into what would become the bloated finale for Boston Spaceships . Let It Beard Boombox Demos are by no means essential listening. More akin to stuff buried on the Suitcase collections, or a Psycho and the Birds record, the listener must proceed with caution over the next 70 plus minutes. Blind 20-20 [Demo]- 2 Where as the Let It Beard version takes the listener on a 3 minute twisting ride though various styles, the demo version practically sounds like a slopped together, mashing of chords, and mumbling. How Chris Slusarenko and John Moen (Boston Spaceships) made sense of this and figured out parts is beyond me. Juggernaut Vs. Monolith [Demo]- Same acoustic demo version that originally appears on Disc 9 of Suitcase 3, released under the GBV moniker in 2009. Read the review there. Tourist UFO [Demo]- 2 Sad-sac gloomy tune. This lo-fi version gives the song a different, more intimate feel. Nearing 4 minutes, it's rather taxing to get through the entire demo. Minefield Searcher [Demo]- 3 One of the highlights of Let It Beard, the good-will is fairly lost in this demo rendition. Gone are the bright little hooks that get you in the verse. Some potential can be seen here. Make A Record For Low Life [Demo]- 3 What comes off as an average tune on the finished LP, plays out interestingly here in this lo-fi rendition. The "darling make a record with me" outro on this recalls why we fell for these recordings in the first place. The tape cuts in and out, and sounds as if Pollard cut and pasted his parts in here. Let More Light Into The House [Demo]- 2 Still a glum, muddy song. And as an acoustic demo, it's tough to get through. The silver-lining, sitting through it proves to be a moody, dense lo-fi listen. Still tough to chew. You Just Can't Tell [Demo]- 2 One of the punkier, almost new wave, highlights of Let It Be, this demo is rough representation of the propulsive track it became. Chevy Marigold [Demo]- 3 One of my least favorite songs off Let It Beard, due to it's falsetto, soulful backing vocals, and cheesy delivery, this demo is simple, and shows some promise that seems lost on the final shellacked product. Damn shame. I choose the demo. Earmarked For Collision [Demo]- 3 Demo stays pretty true to form. Offers little insight into an attitude laced, kind of downer track. Parts of these recordings are cut and pasted in. Toppings Take The Cake [Demo]- 3 I'll take this version over the LP version. Really dig Pollard singing "Deuteronomy" over and over. Meet the man who can sing the oddest named book of the bible on repeat, and make it stick. Tabby And Lucy [Demo]- 4 One of the highlights of the LP, this demo is pretty damn solid too. More cut and paste effects from Pollard to piece this together. As a lo-fi track, this one holds its own. (I'll Make It) Strong For You [Demo]- 1 Pretty unmemorable track as a finished Boston Spaceships product. Pretty useless here. Dull. A Hair In Every Square Inch Of The House [Demo]- 1 Almost 5 minutes long and pretty damn hard to get through. Jumbled and full of dead-ends. Hard to see how this one was fleshed out for the LP. The Ballad Of Bad Whiskey [Demo]- 3 On Let It Beard, the lush instrumentation really helps fluff up the track, giving it a much denser feel than this skeletal, but fairly enjoyable demo. I Took On The London Guys [Demo]- 2 .It's evident that the dumb lyrics that bog down the final version of the song were still in mumble stage here. Unfortunately, the end product, and this demo prove to be rather DOA tracks. Red Bodies [Demo]- 1 Goofball singing approach in this really rough demo version. Sounds different than the finished song, in a bad way. A Dozen Blue Overcoats [Demo]- 1 Rather formless, acoustic banging. Not much of note here. A tattered skeleton of what would ultimately become a lackluster song. Pincushion [Demo]- 2 Short and sweet, fast, tight tune. However, the finished version is leaps and bounds better. This version is rather forgettable, complete with unfinished Pollard demo mumbling. Christmas Girl [Demo]- 4 The song that went on to be the single off Let It Beard in demo form. Still a pretty solid tune, however, missing the triumphant trumpet overture that makes the studio cut so damn good. Let It Beard [Demo]- 2 The meat of this track is fairly decent, although the lyrics are still pretty damn stupid. At four minutes though, it's a trek to get through. The Vicelords- 3 Stronger version than what appears on Let It Beard. I dig this as a cut and paste lo-fi tune. Feels less grating than the finished product. The abrupt ending is vintage home recorded Pollard. German Field Of Shadow [Demo]- 2 Rather forgettable tune, with frantic strumming. Pretty big downer track. Speed Bumps [Demo]- 3 The Let It Beard version really shines as a late LP gem. The demo version looses some of the luster that was built upon by the full band version. The hooky melody is lost in the choppy strumming and instrumentation is missed. No Steamboats [Demo]- 4 Excellent, simple guitar picking. Both melancholy and airy. Lo-fi demo shows promise, sans some out of tune vocals and choppy mumbled lyrics. You In My Prayer [Demo]- 3 Frantic strumming and declarative delivery show some early promise in this demo. Would stand out on a Suitcase collection. Full band version is worth the spin on Let It Beard. Inspiration Points [Demo]- 2 The Four part lo-fi demo of the mini-epic that closes out Let It Beard. Part one contains Pollard, without lyrics mumbling husky voiced, drunk delivery type stuff. The rest of the demo proves a rough sketch to get through, leaving behind any of the hi-fi pleasantries that come with the see-sawing and fully fleshed out full-band version.